ArcGuard Arc Flash Kit with Long Coat & Leggings. 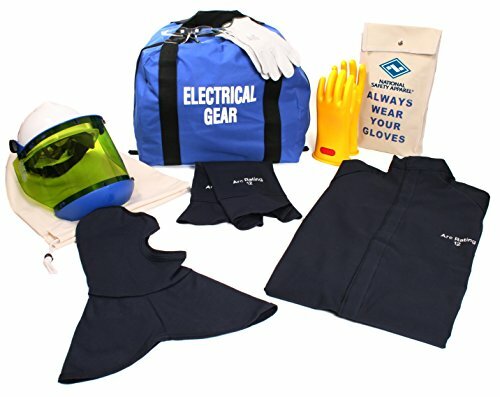 Kits Include: FR UltraSoft Long Coat and Leggings; Class "0" Voltage Gloves; Glove Protectors; Arc Flash Hood with Face shield; Safety Glasses; Gear bag (Arc Rating=12 cal/cm²) HRC 2. NFPA 70E Compliant. Manufacturer: National Safety Apparel, Inc. Publisher: National Safety Apparel, Inc. Studio: National Safety Apparel, Inc. If you have any questions about this product by National Safety Apparel Inc, contact us by completing and submitting the form below. If you are looking for a specif part number, please include it with your message.